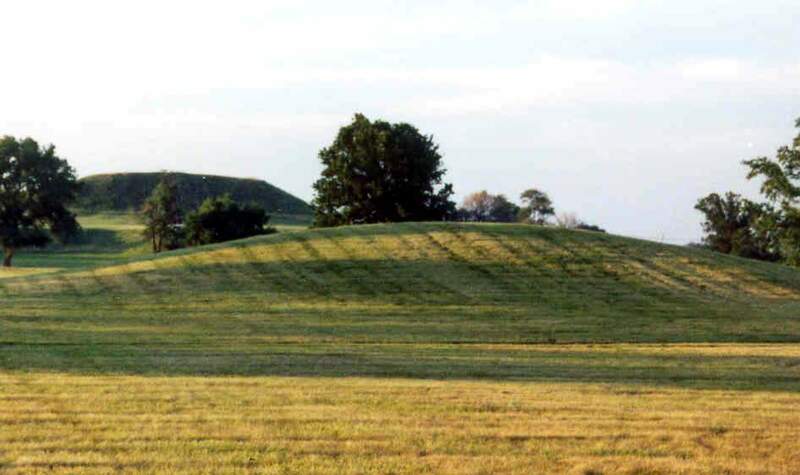 Aside from Monks Mound, Mound 56 is one of the most illustrated mounds at Cahokia. Both Wild and Bodmer show it as a tall, even accounting for some exaggeration of vertical scale, ridge-top mound. Both of these illustrations were drawn in the 1840s before extensive cultivation of this area had taken place. Today the mound is greatly altered from its original form by cultivation and appears as a low, domed rise. Mound 56 is shown as conical on the Patrick Map. The McAdams Map of 1882 gives a height of 15 feet (4.6 meters); the Thomas Map of 1894, 12 feet (3.7 meters); and the Peterson-McAdams Map of 1906, only 5 feet (1.5 meters). The 1966 UWM Map, using a base elevation of 127 meters (416.7 feet), shows a height of 3.9 meters (12.8 feet) for this mound. It is hard to understand how Peterson-McAdams could have given a height of only 5 feet in 1906 unless they confused it with some other nearby mound. However, the location seems to be most closely related to this mound.